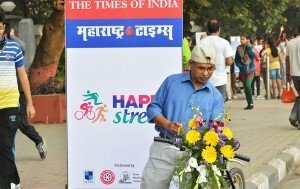 Happy Streets in Pune is an initiative led by the Times of India group to get the residents out on the streets on the Sunday morning and interact with each other rather than just going to the malls or the cafes. For this special day, the streets are cordoned off and no vehicular movement is allowed and people are allowed to do whatever they enjoy doing. Every weekend Happy Streets takes place in different locations across the city – Aundh, Pimple Saudagar, Kalyani Nagar, Kothrud etc. 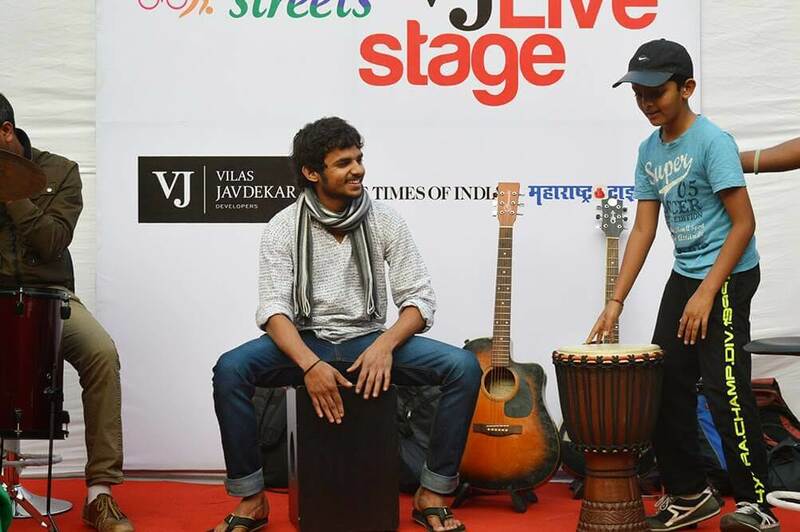 The last schedule for Happy Streets this season was at Kothrud. More on the schedule for Happy Streets once it gets declared. 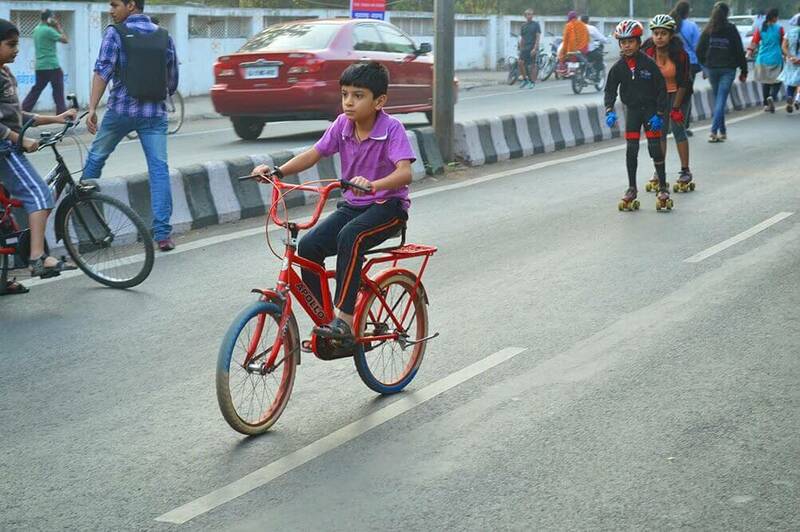 The idea is also to get the kids get excited about and to get them involved in numerous outdoor activities. And not to mention the senior citizens for whom this is an excellent opportunity to be out with the family, meet like minded people and also participate in many health activities like group Yoga. Happy Streets is also supported by the Pune Police, the city’s traffic police, Pune Municipal Corporation, Embarq, The Times of India and Maharashtra Times to drive home the importance of safe walking and cycling infrastructure across neighbourhoods in the city and to encourage people to use non-motorised transport (Ref: TOI). 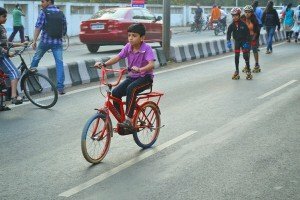 In the past Pune was always known as a city of cyclists, but with booming urbanization and construction activities, the habit is dying out. I do hope this initiative will help revive it. While I walked on the Happy Street of Pune, I could immeiately feel a positive and happy vibe. There was so much enthusiasm on part of all the participants as well as the organisers. Just as you start walking into the main part of the street, a stage a visible with some very enthusiastic dancers on stage leading a group of hundreds of Pune citizens to groove their bodies. There were kids, youths as well as much older people as well. The energy was almost enthusiastic. A part of the walk was reserved for cyclists and skate-boarders and I was much impressed to see them zooming past the crowd, almost tempting me to borrow a skateboards from one of the kids. I am glad I didn’t as I am not sure if it would have supported my weight and if I could have actually balanced myself on it! Moving on there was a small football ground which had small kids learning a few tricks from older guys in uniform. From afar I could also see shuttles flying in the air, and these were from a number of badminton enthusiasts who had managed to find some space on the busy street to play the game. There was also a drumming booth where kids were also given tips and also allowed to try their hands on the drums. I personally enjoy drumming, and was actually really happy to see youths taking time out to train the young ones. Another thing I was impressed was the well organized Yoga camp – a group of three women led the camp and people of all age groups were participating. If you also want to participate, just carry a Yoga mat and wear comfortable clothes and you too can join in. 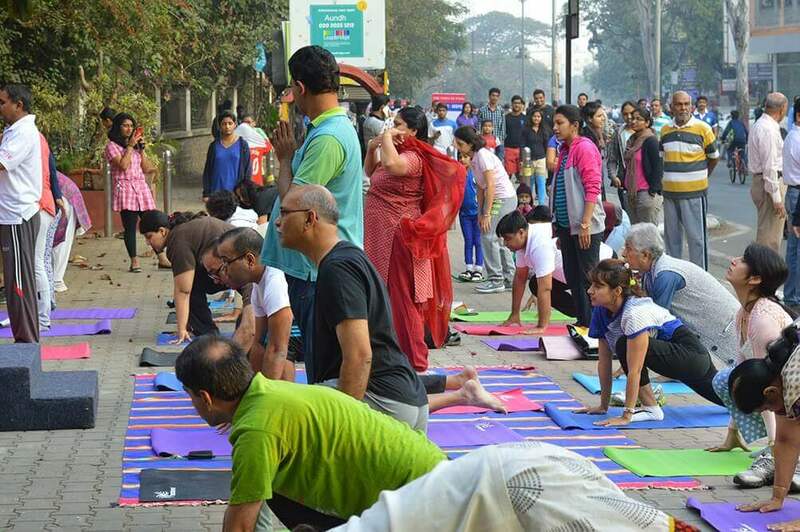 I am not a Yoga expert but it did seem fun to do it early in the morning with a big bunch of like-minded people.